It starts with a single Thought and grows more powerful as you use it. 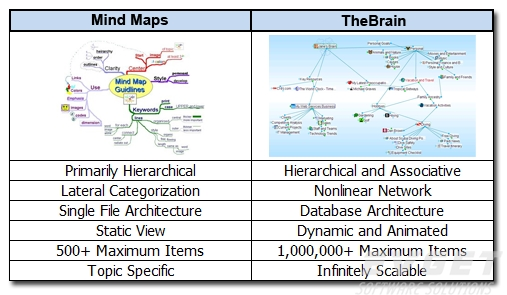 Think of it as a living mind map with unlimited space for everything you want, are learning or need to remember. Each idea can grow and evolve with all related Thoughts instead of being separated in folders or lists. Use TheBrain to manage specific projects or as an "everything in your life manager" to get the big picture on your ideas and find the right information in seconds. See and do more with digital thinking. Where can you really go on your computer today to hash out a new idea, current event, or expand your plans in a meaningful way? 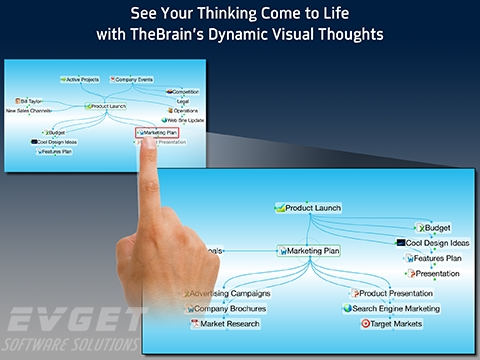 TheBrain lets you digitize your mind so you can literally see your thinking and refine your ideas. Each of your Thoughts comes to life on-screen with connections to other related Thoughts, creating a context for thinking and action. 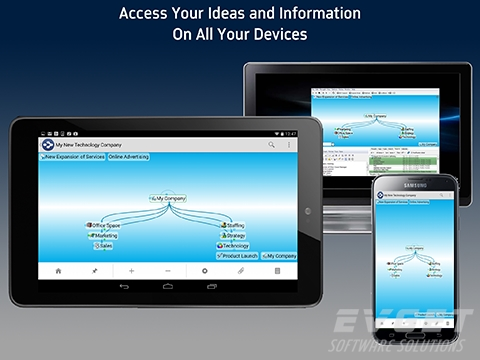 Integrate all your information in one place. Your Brain can store an unlimited amount of all kinds of information. Write notes for all your ideas. 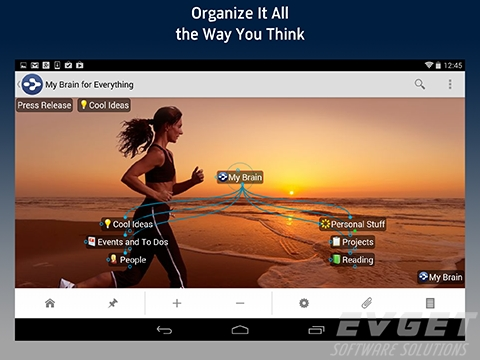 Save files, web pages, images and even emails into TheBrain for instant access. Adding things is as simple as drag and drop. Access all your stuff anywhere. Your digital Brain works across multiple platforms and computers and can be synchronized across multiple machines. 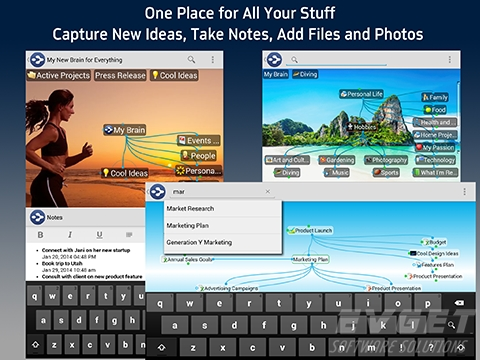 Access your Brain from TheBrain desktop software, a Web browser, or even your mobile device. Keep your data locally, plus a backup online for remote access and sharing with friends. Activate any idea or file in seconds. TheBrain not only brings up the right idea but lets you see how it relates to everything else... so you are prepared for anything. 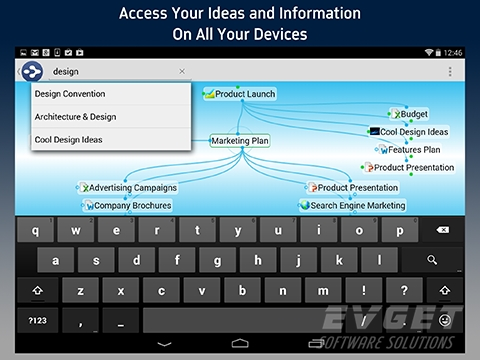 This means you can shift contexts quickly and get an immediate visual briefing by viewing connected topics. Move beyond linear file folder hierarchies and organize files the way you think - under multiple categories or projects. Anything can be linked to anything else. Track and save multiple versions, add notes and tag documents with priorities. Even integrate Outlook, Apple Mail, or webmail messages for a complete view of your projects. Get the big picture on your information. 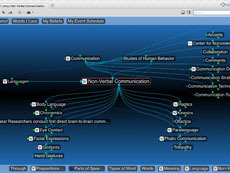 TheBrain lets you see how your ideas and information are related. Use powerful visualization to discover information that would normally be overlooked, make connections and gain new understanding of your projects and content.